Wright L. Smith ’17 (left), Anastasia S. Moran ’17 (center left), Alexander B. 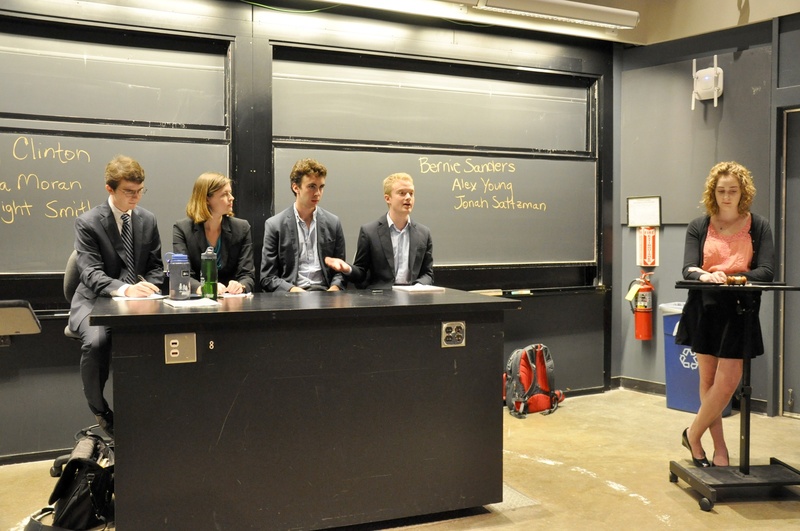 Young ’16 (center right), Jonah W. Saltzman ’17 (right) debate as Hillary Clinton and Bernie Sanders representatives at a Democratic primary debate hosted by the Harvard Political Union, while Raya R. Koreh ’18 (far right) moderates. Students supporting the frontrunners for the 2016 Democratic nomination for President, former Secretary of State Hillary Clinton and Vermont Senator Bernie Sanders, met Thursday evening to debate the merits and viewpoints of the rival candidates. Hosted by the Harvard Political Union, the debate covered topics ranging from income inequality to campaign finance to foreign policy, questions that have repeatedly surfaced in the two candidates’ campaign rhetoric. Ana Moran ’17 and Wright Smith ’17 debated in favor of Clinton, while Alex Young ’16 and Jonah Saltzman ’17 represented Sanders. Though the first primary is months away, the Harvard Political Union is aiming to inform Harvard students and affiliates about their choices in the Democratic race. Doubting one of Sanders’s most visible opinions—against the use of corporate and super PAC money in politics—the Clinton supporters said that to reject money from large corporations and millionaires would be tantamount to handing Republican opponents the election. For their part, Sanders’s supporters criticized Clinton on her foreign policy record, saying she was doing the same as the politicians before her and that her willingness to use military action would result in even more violence against Americans. Moran and Smith returned, however, with criticisms of key policy objectives of the Sanders campaign, saying that his status as an independent leaves him without any connections to Congress or any way to work with members of Congress to pass legislation. Although the event highlighted divisions among the Democratic Party’s top candidates, it sought also to provide a forum for unity. Koreh opened the floor for audience members, some of whom proceeded to strategize the best way to secure a Democratic victory over Republican opponents in 2016. The four debaters said that their interest in partaking in the event was a result of their passion for politics and their enjoyment of debate. They also wanted to inform audience members of each candidate’s viewpoints and the ways in which they differ. Representatives from both sides also said that they considered their debate opponents friends.